These sweet potato nachos are loaded with salsa, chicken, beans, peppers, cheese, and guacamole to create the perfect game-changing appetizer. We’re gonna dig into these bad boys ASAP but first, can we talk about grown-up things for a minute? Grocery budgeting.  Last month we started actually budgeting our grocery spending. 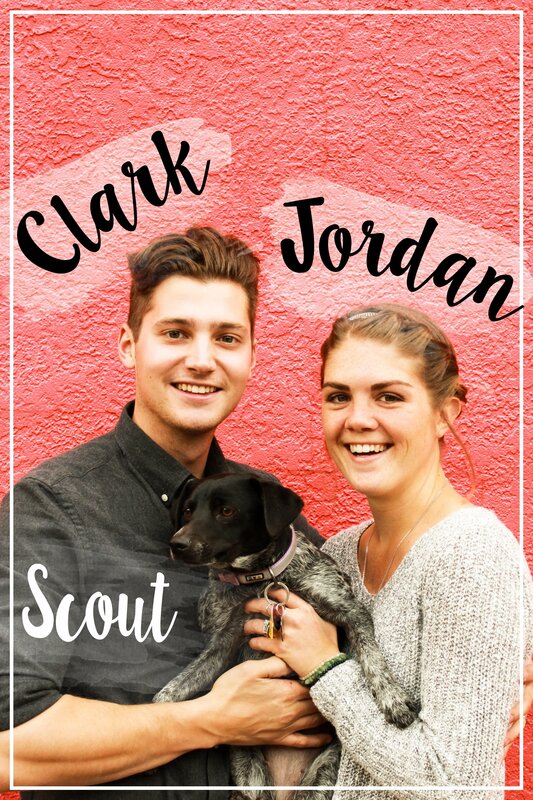 What that means for us is that we’re setting aside a certain amount of income that we allocate towards food each month and sticking. to. it. 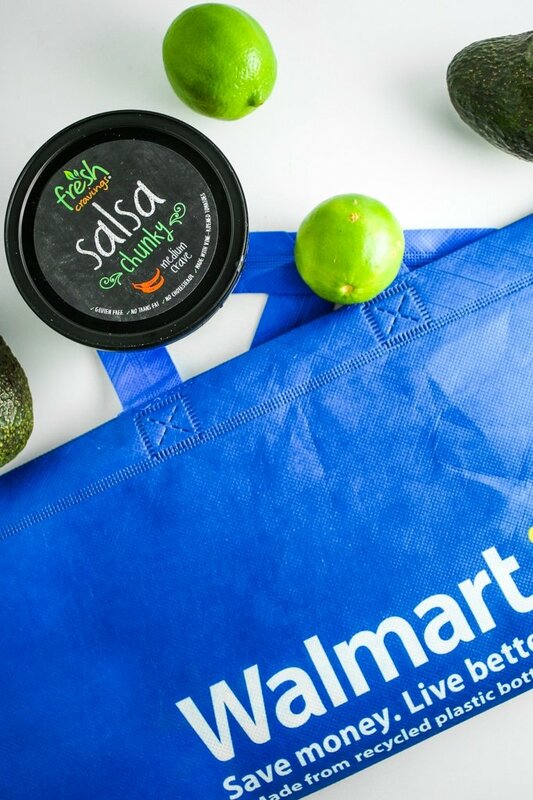 It also means finding creative ways to sneak in extra savings so we can stretch that budget a little further – AKA iBotta offers that pay us back in cash rewards for things like the salsa we put all over these nachos and obviously, regular printed coupons. Admittedly, we should have started grocery budgeting a loooooong time ago. But now that we’re finally in a groove with what food is for blog recipes and what food is for just us, it’s more realistic (read: easier) to do. So far, the best part about budgeting is that it makes grocery shopping less stressful. These nachos can be eaten one of two ways. You can make yourself look like a hot mess and go at them with your hands – which I recommend. Or you can try to be dignified and attack them with a fork. To each their own, my friend. With this nacho situation, it’s all about the toppings and how messy we can get. Layer up the cheese and the beans and the peppers and the salsa – and then add more of the salsa so you can dip the fries in it because the salsa is THAT good. I’m using Fresh Cravings Chunky in this recipe, but they also have a Restaurant Style that is perfect for dipping because it’s blended. It has just exactly the perfect amount of spice! This is a revelation. 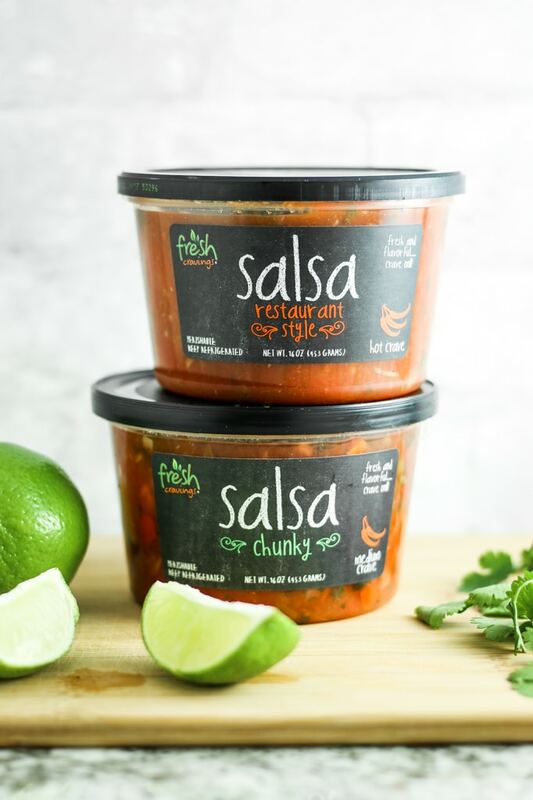 It’s the freshest tasting salsa available. 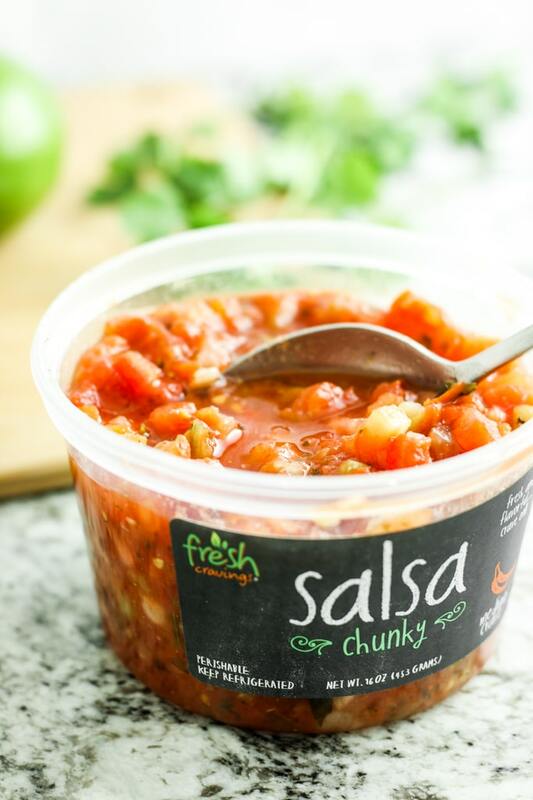 They use fresh, vine-ripened vegetables in this refrigerated salsa and it is never cooked or pasteurized. So it tastes like that glorious stuff you can make in the middle of summer thanks to garden goodies. The texture is perfect. This salsa still has bold crunch to it which adds another layer to the nacho mouth party. I suggest that you make these for date night. Or girls’ night. Or your next game day gathering. Or New Years Eve. The sooner the better. Just don’t forget to tag me on the Insta to show off your nacho game! This recipe was created in partnership with Fresh Cravings. Thank you so much for supporting the brands that we love! 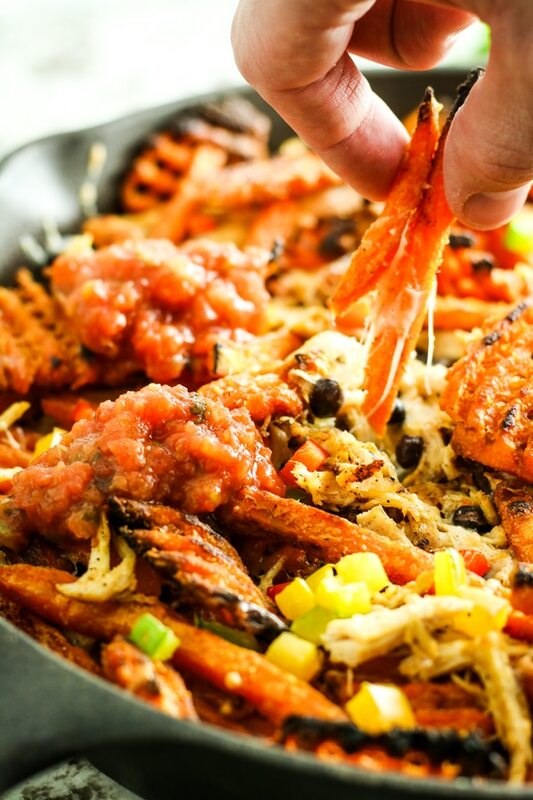 These sheet pan sweet potato nachos are loaded with salsa, chicken, beans, peppers, cheese, and guacamole to create a perfect game-changing appetizer. Preheat oven to 375º. Line a baking sheet with parchment or foil. Place chicken breast on the baking sheet. Drizzle with oil and sprinkle on seasonings. Bake 25 minutes, flipping halfway. Remove from oven and allow to cool. Once cooled, shred the breasts and set aside. Bake sweet potato fries according to instructions. I find that it works best to divide the fries between two sheet pans, making sure they’re spread in a single layer. Once they’re done, remove from oven and set aside. Set your oven to broil – low. Starting with just one sheet pan, sprinkle half of the chicken, cheese, beans, and bell pepper. 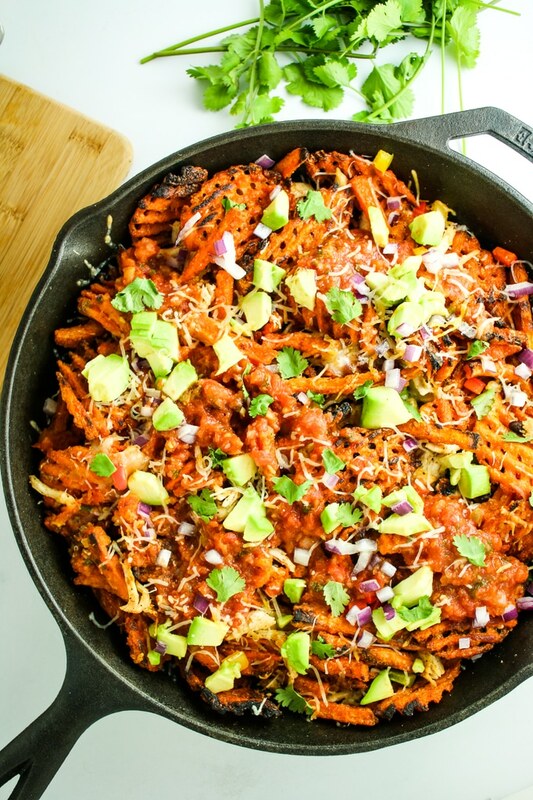 Layer up the sweet potato fries from the other sheet pan and add the remaining chicken, cheese, beans, and bell pepper. Return to the oven and broil for 5 minutes. Remove and add avocado, red onion, cilantro, and any other toppings of your desire. Dig in! Oooh, I just love sweet potato fries!!! What a fantastic idea! I think this may appear at our Super Bowl Party this year! So do I! It’s perfect for game day parties! 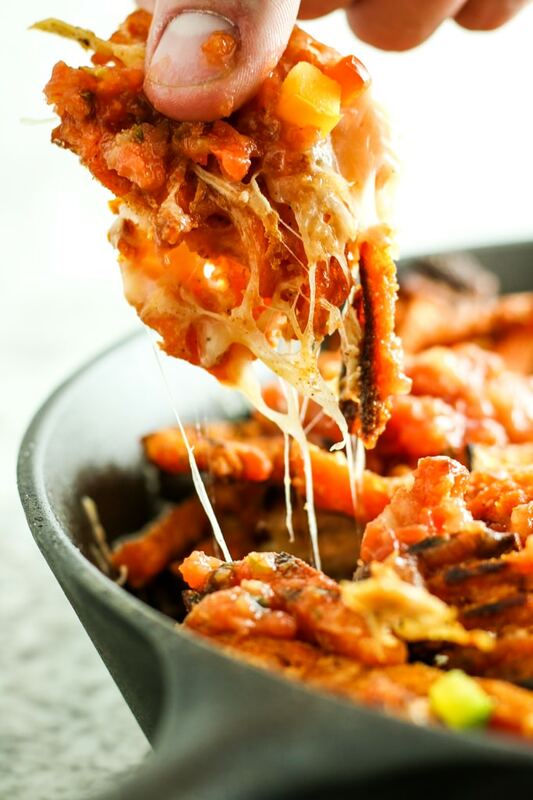 What a unique idea…sweet potato nachos. A great flavor combo you have here. Soooooo much better than regular nachos! Me too! They make this dish so much better. These look insanely good. Love how you made it in a skillet too. Must of gotten some good flavor in there! I make sweet potato chips all the time and now I’m tempted to kick up my game a notch with this recipe! Well, aren’t you fancy!? Homemade sweet potato chips would make this even better! Sweet potatoes and nachos are two of my favorites foods! I have to try this out. It looks very good. Great idea! I bet my sons would like this. I will have to try it out for Super Bowl. Trust me – it’s a game day hit every time! This looks like an easy guilt-free meal! 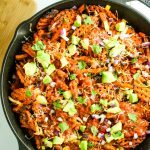 I love the use of sweet potatoes! Yes! I’ll take sweet potatoes over regular any day! I would eat this a fun MEAL on the weekend. I love cooking with my cast iron skillets. Makes a great presentation too. Perfect to make for movie night!! I love sweet potatoes when they are prepared in a savory manner! These nachos sound killer! Excellent idea using sweet potatoes for the nachos. This is a must try.